June | 2016 | WE BIKE, etc. Once again we got up and on the road early. The weather was marginal and a storm was definitely coming our way but after checking the radar and weather station we thought we would have enough time to get to Conway – 16 miles away. On our way out of Groom we were able to see the “World’s Largest Cross” It was as large as the neighboring wind turbines and stood 190 feet into the air. As we were heading to Conway, about 10 miles into our ride it became apparent we were not going to reach Conway before the storm came thru. So we looked for a place to shelter and were lucky to find a grain elevator, pole barn, office and other miscellaneous building to take shelter in. We stopped by the pole barn to check the radar and decide if we could continue or needed to hang for a bit. Luckily we decided to stay put – about five minutes later the wind picked up and it started to pour. 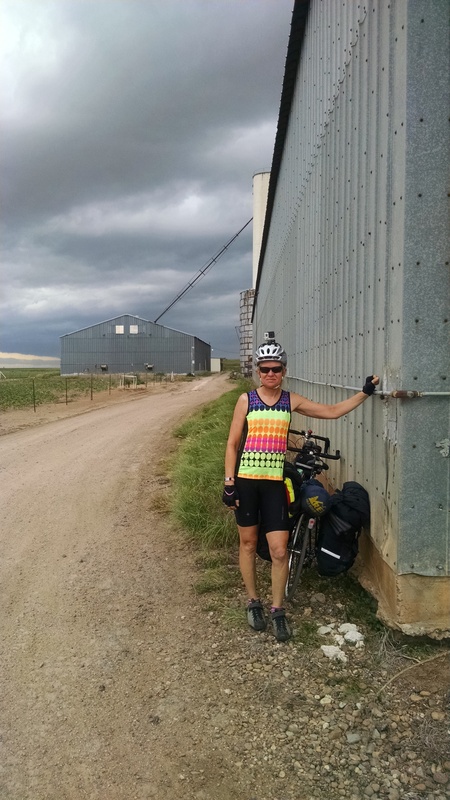 We hauled the bicycle and us into the pole barn and stayed put for about a half hour. 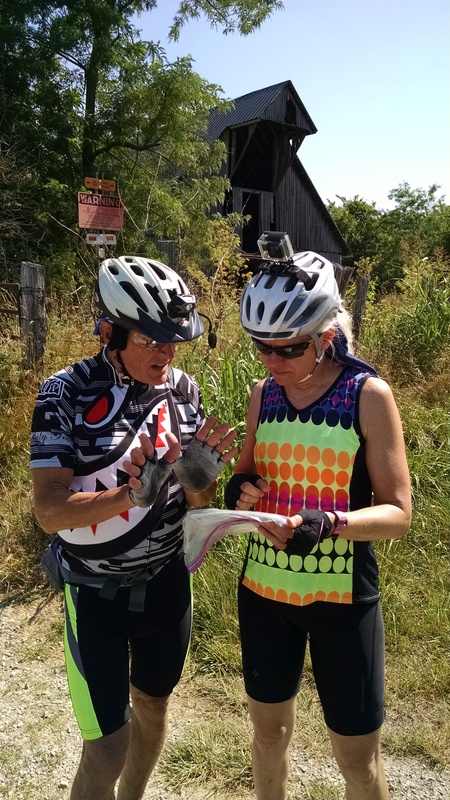 When we first stopped by the pole barn, Tracy needed to go to the bathroom and when done bumped the map out of her pocket and in the wind. It started to blow across the driveway and towards a field that was acres and acres wide. Tracy panicked thinking the map was gone and would end up somewhere in New Mexico. Luckily the field was surrounded by barbed wire and the map in the plastic bag got caught on the barbed wire – thank goodness!! Tracy said someone was looking out for her!! After the storm we continued our ride to Conway. We found two unique things in Conway. The first one is the Slug Bug Ranch – which is a take off of the Cadillac Ranch but with VW Bugs. The second was two large revolvers located at the end of a private driveway. The revolvers were actually grills that some one had placed on either side of their driveway facing out to the street- strange but then we are in Texas!! 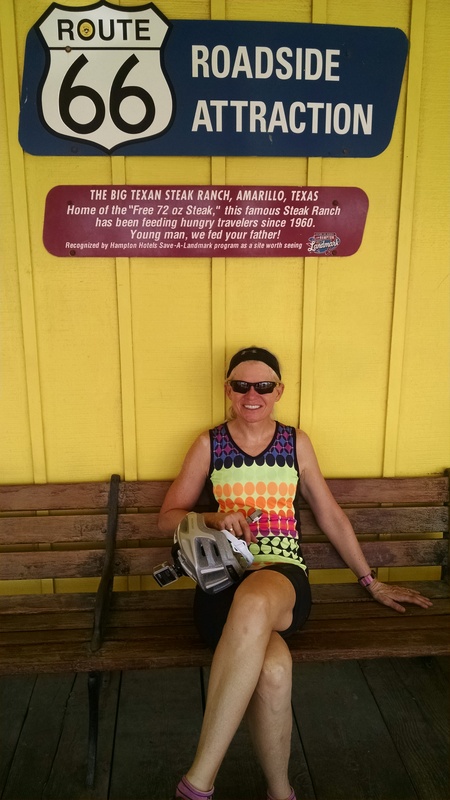 We finally got to Amarillo and our first stop was the Big Texan Steak Ranch and Brewery. You just had to stop after seeing their billboards for miles and miles. There draw is a free meal if a customer can consume a 72 ounce steak in one hour or less. When we were there two gentleman were trying to do it. They actually have a raised table with spot lights that they eat at. They also have a large count down timer you can watch. It is funny and actually gross! 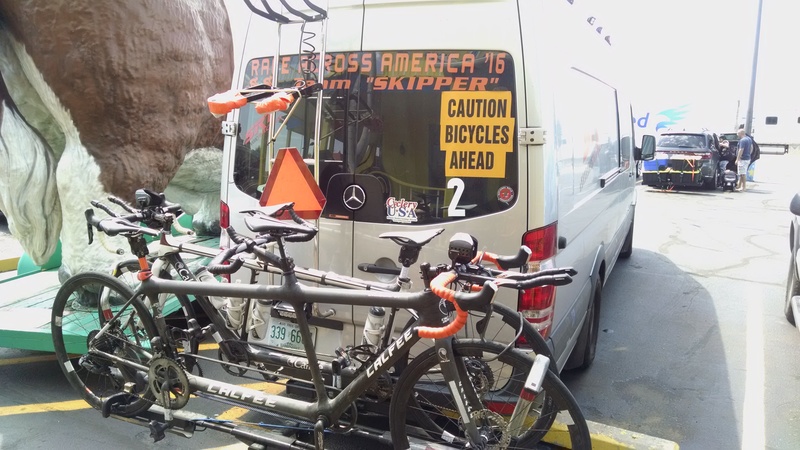 When we were parking our bicycle and getting ready to head into the restaurant – we noticed some really cool tandems hanging on the back of a van – we walked over to check them out. 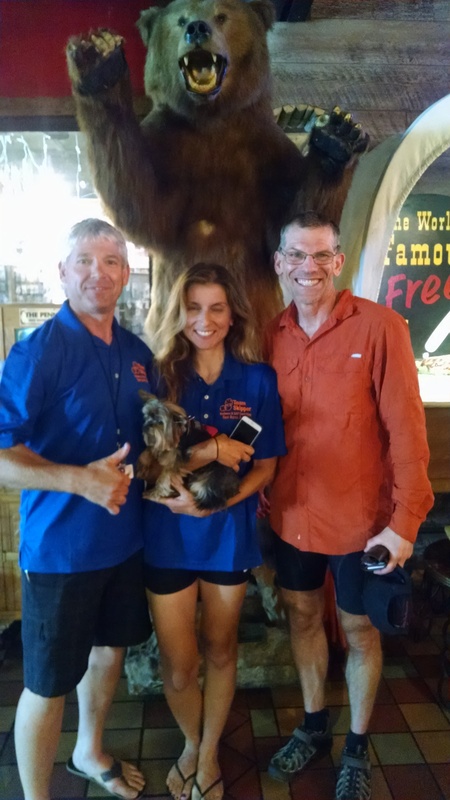 They were hanging on a RAAM- Race Across America van. 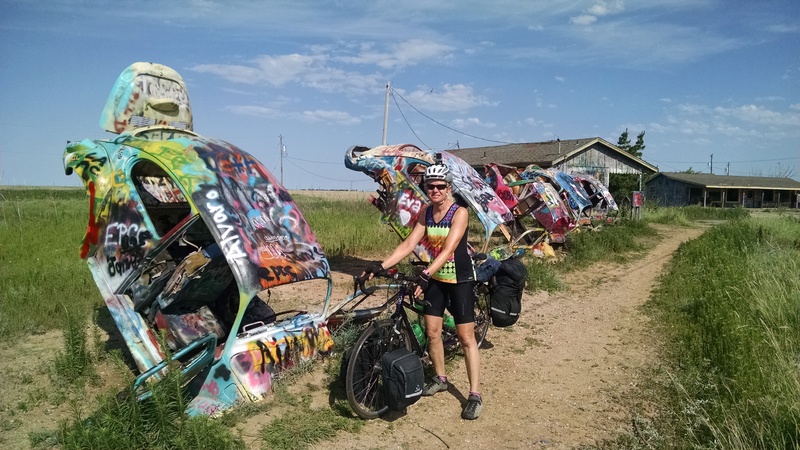 Very cool – if you have not familiar with RAAM it is basically is a bicycle race across the country – it starts in California and ends on the east coast. When we walked into the restaurant a man came up to us probably because we were in bicycling clothes. We then asked him if he was one of the RAAM riders. 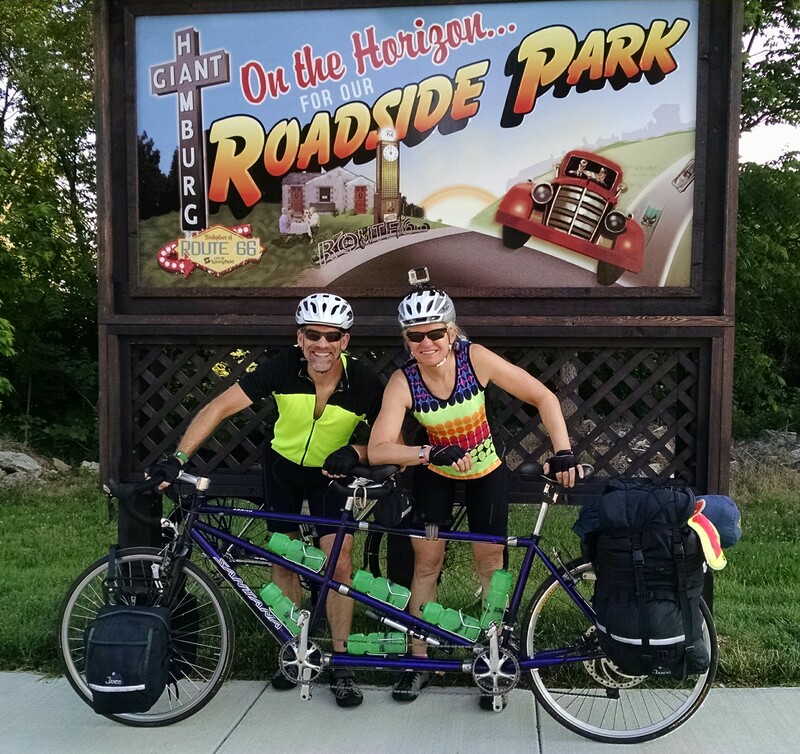 He introduced himself – Michael and his girlfriend Jeanene, they were the tandem riders. It was the first time they had competed in the race and completed it in 7 days – amazing. They also took first place in their category. We asked what their average speed was and it was 20mph – again amazing. (fastest speed was 71 mph) Remember it will take us about 2 months to bicycle across the country and they just did it in 7 days. They were heading back home near Santa Monica CA and invited us to stay at their place if we needed somewhere to stay – very nice. After lunch we had about 8 miles to go to get to our hotel. We are looking forward to a day off tomorrow and Tracy said she plans to sleep until noon. Well we got up in Oklahoma and ended the day in Texas. 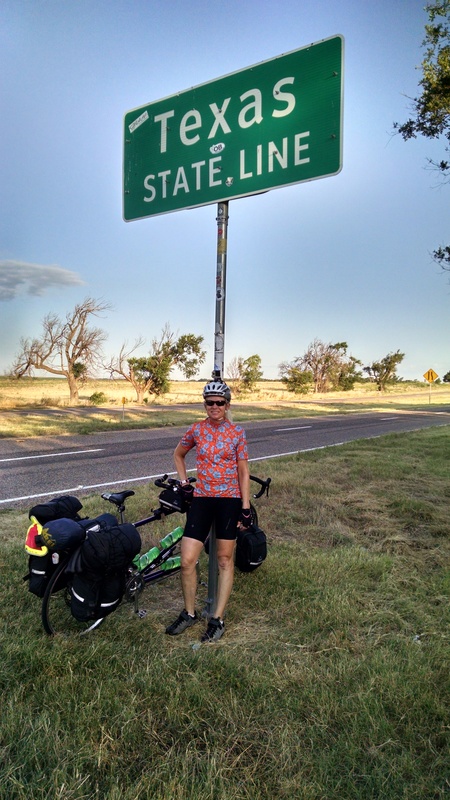 Actually about ten miles into our ride we crossed into the Lone Star state – yea!! It is really beautiful here, although we are climbing again. The views are amazing thru the open grassland. We had about 1,000 feet of elevation gain today. The ride started out flat and then started to climb. 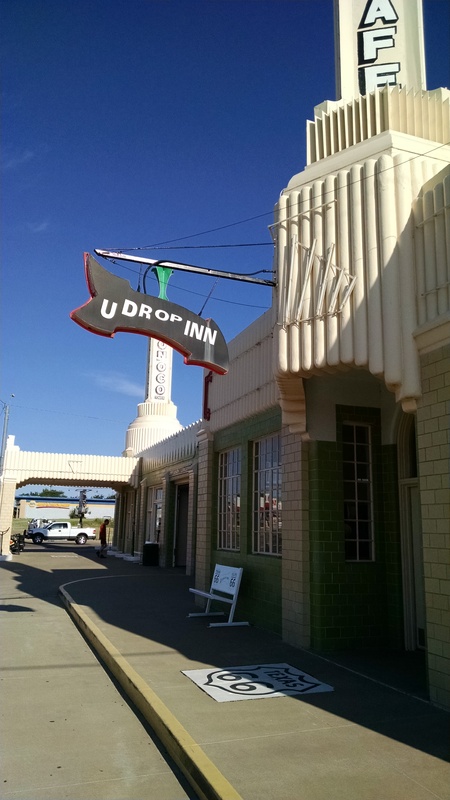 The first town we came to in Texas was Shamrock which has one of the most iconic symbols of Route 66 – U – Drop Inn. It is a beautifully restored art deco building that now is the home of the Chamber of Commerce and tourist information center. We of course were there early before it opened. The building originally held the Tower Station – gas station and U-Drop Inn café. 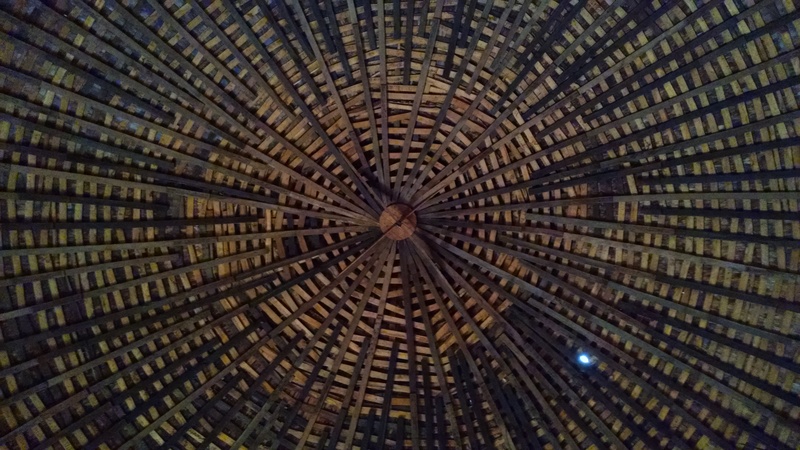 Check out the attached pictures to see if you recognize this iconic building – we did. 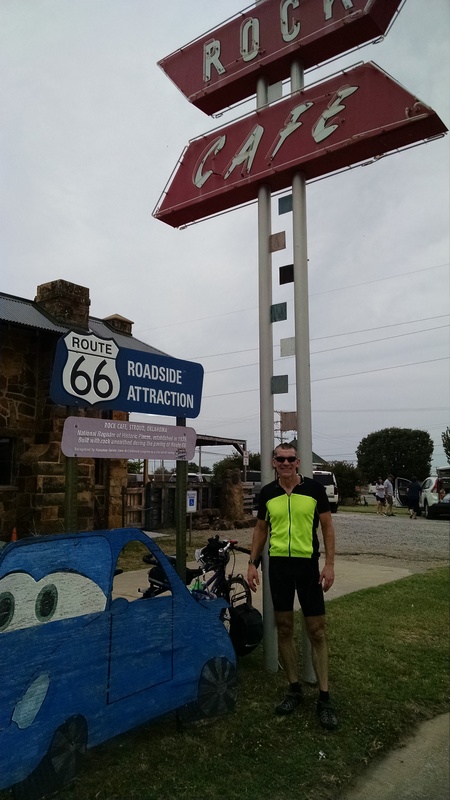 Our next stop was the Town of McLean which claims to have the “first Route 66 Museum ever”. Lots of communities have Route 66 Museums but this is the first one to claim to be the first!! We skipped the museum and had a great lunch at a small café/market in town. McLean has a population of about 800 people and offers quite a bit for such a small town. They even have the Devils Rope Museum where evidently you can learn everything you ever wanted to about barbed wire – we skipped that museum also. Our ride today was filled with lots of climbing and wide open spaces intermixed with a few small towns. The populations of the towns was between 36 and about 2,000, so we really had to plan ahead to make sure we had enough water and food for the long stretches of open space – we did just fine. Today for the first time we had to ride for about 6 miles on Interstate 40, it sounds scarier than it is!! The road has a nice wide shoulder- 14ft for us to ride on and the motor vehicle drivers are great and typically pull over to the left lane anyway. We especially like the professional truck drivers – they just get it and when at all possible move over a lane for us. They also are very friendly and it is not uncommon for us to receive a friendly beep, beep and a wave when they go by. 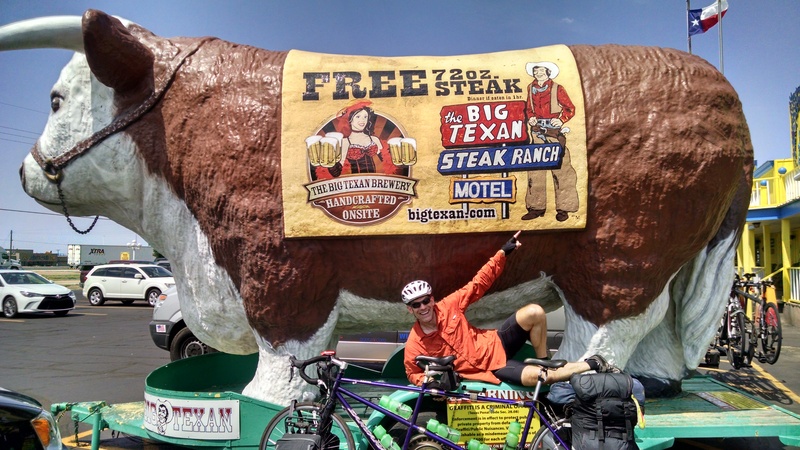 There was a rest stop on the interstate which we stopped at for a short break – people were so funny and were asking us why we were there on our bicycle. We explained that the route had us on the interstate because there was no other roads available for us to get thru this area. The rest area sat on a high hill and had amazing views. It also had some interpretative information inside about all the wind turbines which are abundant in this area. After getting off the interstate we had another 20 miles to Groom, TX our ending point for the day. Groom is a very small town – about 600 people, they don’t offer much here but enough to get you thru. Groom is known for The Leaning Tower of Texas. Which is a water tower which was never a working water tower bought in as a marketing ploy. The owner Roger Britten bought the tower from an adjacent town and purposefully installed it with and 80 degree angle with two legs in the ground and two dangling in midair. His truck stop and restaurant were very popular with this attraction. Unfortunately there no longer is a restaurant or truck stop here but the Leaning Tower remains and got us to stop and take a look. 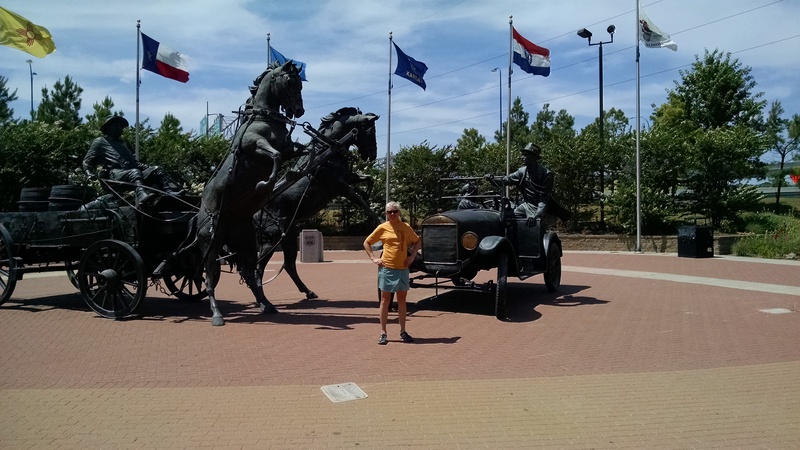 Tomorrow we have a short ride to Amarillo and will take the next day off – YEA we need a break. When we left Weatherford this morning it looked like it was going to storm but luckily it stayed north and east of us. But it also helped keep the temperature down and gave us a nice tail wind all morning. We were happy with the weather and wind today – we can’t remember the last day we had a tail wind and it has been extremely hot for quite a while. The National Route 66 Museum is located in Elk River. We stopped to take a picture but did not take the time to tour it, although it did look cool and probably would be fun to explore. We just had too long of a day on the bicycle to make a stop. That is one of the hard things about bicycle touring sometimes you just don’t have the time to check out something or it is off route a bit and you don’t have the time or the energy. Oh well I guess we will have to come back someday. At one of our many gas station/convenience store stops, when returning to the bicycle to put the full water bottles back a young man was admiring the bike. He asked me about our trip and how it was going. 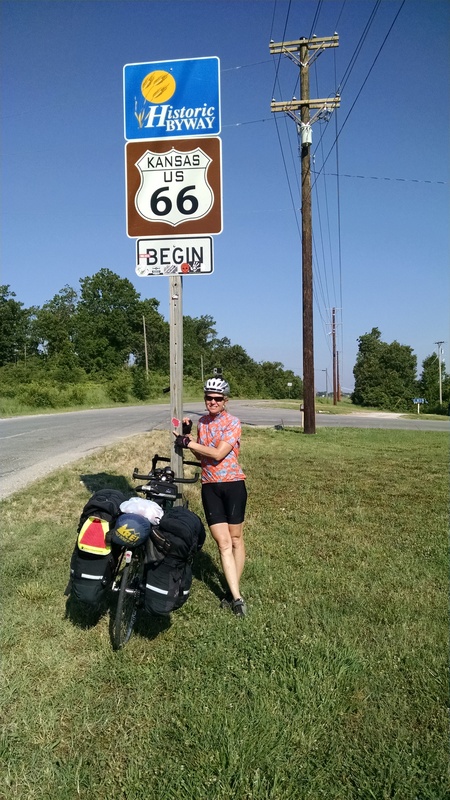 He said he would love to bicycle across the country someday and then went on the explain that he had walked Route 66 last year. He told me it took him 5 months and he really enjoyed the adventure – impressive. Upon heading back inside I noticed he had a big backpack and his tennis shoes and planned to ask him where he was off to this time but when I came back out he was gone. We are getting out into the prairie/grassland areas in Oklahoma. It is really pretty with large expanses of grassland and hills. The towns we pass thru are small and spread out. We have enjoyed Oklahoma and will be sad to leave it tomorrow. The people here are very kind and welcoming. For example, we were standing outside a grocery store in Erick and an older woman came up to us and was asking about our trip and wanted to know all the details. She then welcomed us to her town and said how great it was that we were there. She then apologized that the museum was closed and we would not be able to see it unless we could tour it on Tuesday, we explained we really needed to continue on. She was so genuine about everything that we truly felt welcomed to the Town of Erick!! Hills and Heat and Wind – Oh My!! Today was another hard day on the bicycle due to the hills, heat and wind. We also had a mechanical problem and got lost!! So we got going as early as possible and were cruising right along when about 10 miles into our ride we blew the rear tire. When the tire blew it was a really loud bang – which shredded the tire and blew a two inch hole in the inner tube. We had everything we needed to fix the tire and got it taken care of fairly quickly and were back on the road again. 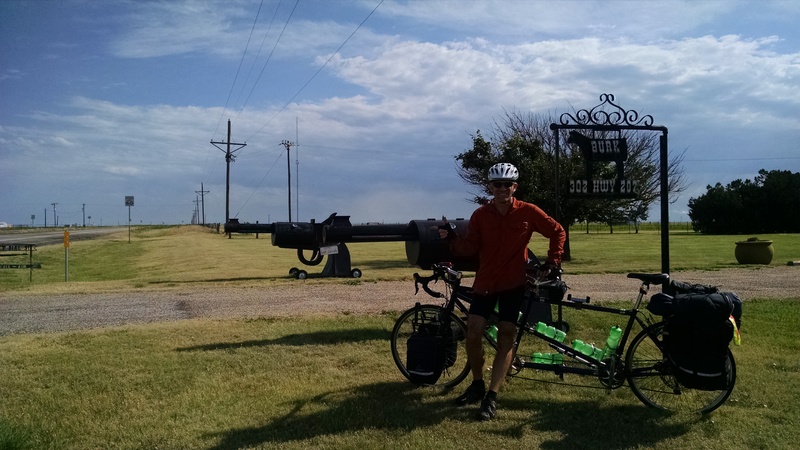 We made it to the town of Bethany – just west of Oklahoma City and were to ride around one side of Lake Overholser to continue west. Well Tracy’s navigating was not good and we ended up traveling along the east side of the lake instead of across the north end. By the time we figured it out we had gone two miles off route – oops!! 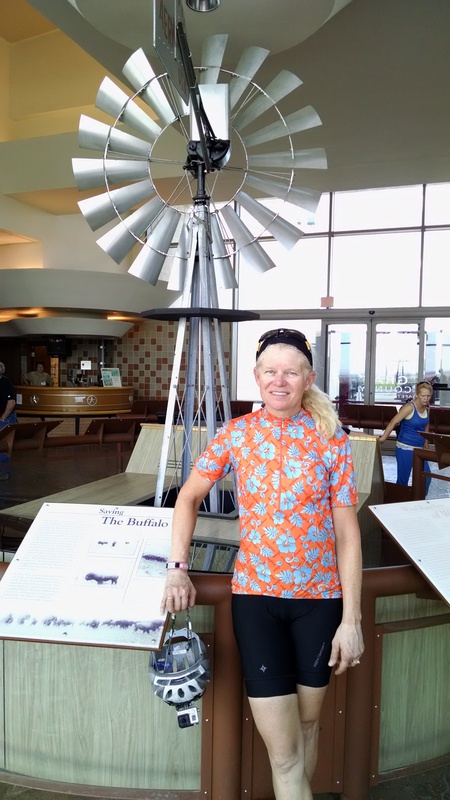 So we turned around and headed back north to cross where we were suppose to, on a good note the lake is beautiful and it has a nice bicycle trail around it – we got real familiar with the bicycle trail. We finally got back on route and had about 45 miles to go. 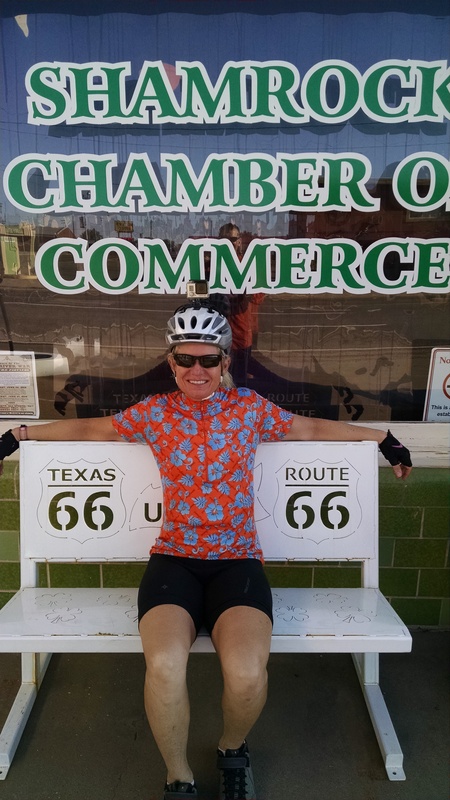 The rest of the ride was uneventful and we arrived in Weatherford about 5:oopm – it was a long day on the bicycle. Although one odd thing did happen – we were waiting at a signal to turn left and a truck drove thru the intersection pulling a trailer with an ATV on it. When suddenly the trailer was no longer attached to the truck and was flying down the road on it’s own. We were amazed that it did not flip or run into anything, it finally stopped and the guy went over to it and hooked it back up. Very strange. For dinner we went to Lucille’s Road House which was right next door to our hotel. 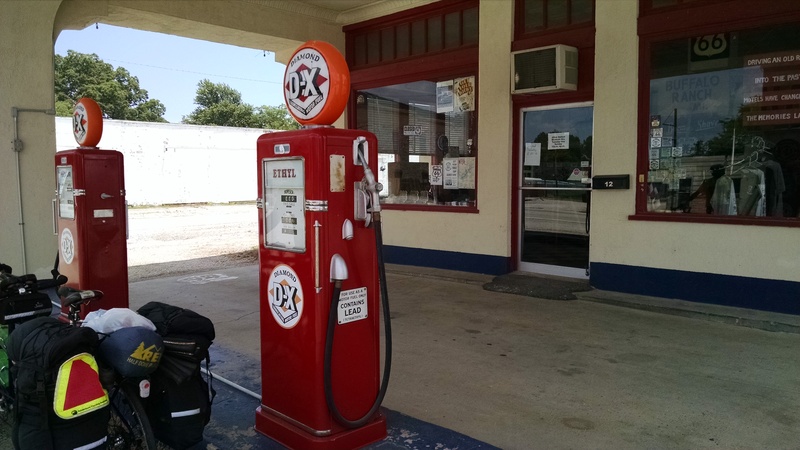 It was originally located further east on Route 66 near the Town of Hydro. It was built in 1927 and Lucille and her husband bought the restaurant and motor court in 1941, When the interstate went it – the family had to decide if they wanted to keep the business open which they did for 59 years. The original site is marked with a sign and was put on the National Register of Historic places in 1998. We bicycled right past it on our way in. At some point the business moved west and now is in a new building with lots of cool historic treasures displayed and great food served. Our ride was shorter today so we left a bit later than normal. Was not a great idea due to the fact that the ride was a hot one with nasty cross wind, narrow hilly roads and lots of traffic!! Oh well we made it!! The first city we hit that had some cool things to see was – Arcadia about 30 miles into our ride. 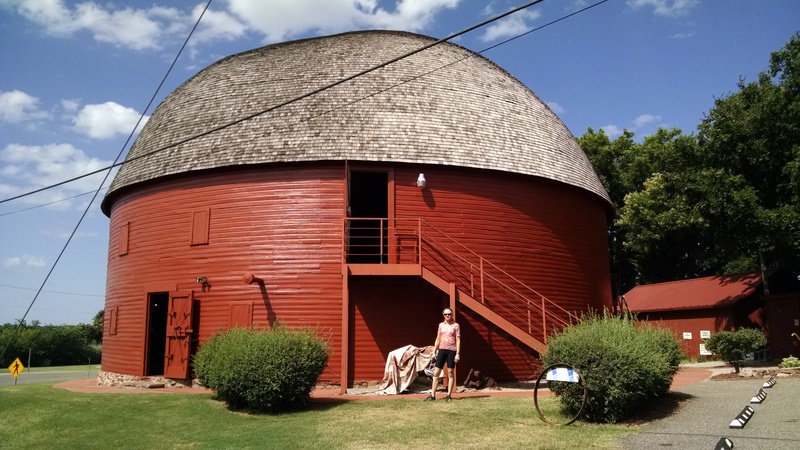 It has a restored 1898 round barn, it is in amazing shape and has lots of historic information displayed in it. Evidently a group of volunteers got together to save the barn many years ago after the owners donated it to the city. It is great to see what volunteers can do when they all pull in the same direction. When we were visiting two gentlemen were touching up the paint on the barn, it looked great. The upper level of the barn is available for community use – weddings, family gatherings etc. It would be a fun place to hold a special event. 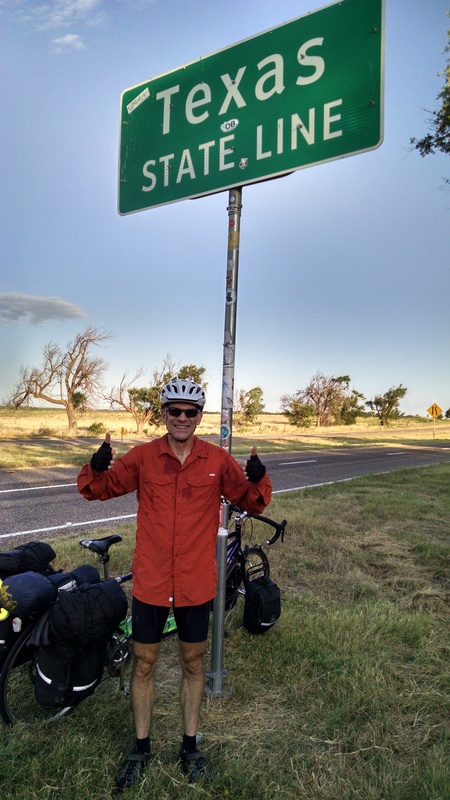 All to soon our tour was over and we had to climb back onto the bicycle for the last 20 miles to Oklahoma City. 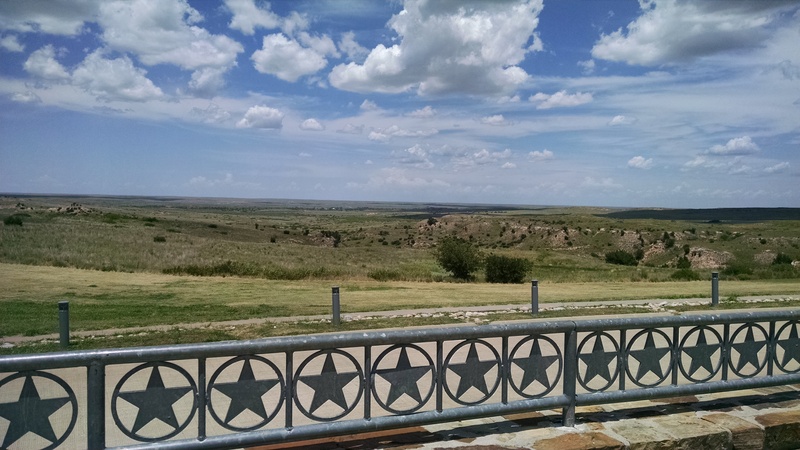 We were told that this part of Oklahoma was pretty much flat – NOT. There are many long gentle hills, the kind that wear out your legs as you climb one, down the next and up again – repeat. For most of the ride we were on Route 66. Unfortunately the nice wide shoulder we had been enjoying the past couple of days was no where to be found. We made it to Edmond, OK a suburb of Oklahoma City and stopped for a snack and coffee at Starbucks – yea. We then made the last push to the city – hopped up on caffeine and sugar. Tonight we plan to check out a local brewery and possibly the Outdoor Symbolic Memorial to the victims of the 1995 bombing of the Alfred P. Murrah Federal Building. We were up by 5:00am to leave our Warm Showers Host’s home by 6:00am We left early for a couple of reasons, one was to beat the heat and the second was to beat the rush hour traffic out of the city. Tulsa is a nice city but their roads are not real conducive to travel by bicycle. They are busy and narrow and the traffic moves fairly fast. So we thought it would be wise to get out of the city before rush hour. Robyn our host gave us great directions to get back on route from her house and before we knew it we were on our way west again!! Robyn and Mike were great hosts and Robyn even got up to see us off in the morning. Their home is beautiful and their gardens fabulous. Robyn is a Master Gardener and her gardens definitely stand out. They also raise chickens and we had fresh eggs for breakfast our first morning with them – yummy. Leaving Tulsa we were once again on Route 66 and traveled thru a small town about ever 10 -15 miles. We have also been starting to see vineyards and in Stroud the Stable Ridge Vineyards is suppose to be a good one. Not being wine drinkers we continued on our way and bypassed the winery. One of these days we will have to stop to buy some wine for our daughter Melissa and send it to her at home. We then got to the “Rock Café”, and stopped for lunch. The food was amazing and Peter absolutely loved his no bun buffalo burger served with sauerkraut. When he was paying the check he commented to the waitress how much he enjoyed the sandwich and especially liked the parmesan cheese on it. After some discussion and checking with the cook it was determined the cheese came from BelGioioso Cheese produced in Green Bay Wisconsin. The woman said it is the best cheese and it definitely makes the sandwich. The restaurant also plays a part in the Pixar movie “Cars”. Where they based the character Sally Carrera on the “Rock Café” owner Dawn Welch. I guess we really do have to see the movie. We never did see Dawn Welch though. We made it to our Chandler our home for the night fairly early so decided to tour the Route 66 Interpretative Center. It is a cool museum located in a refurbished 1936 armory building. After our tour we checked out some of the movies they had. It was a neat design because you sat in the seats of older cars to watch the videos and even laid on the bed of a make shift hotel room to watch some of the videos. It definitely was a unique way to present the history of Route 66. Once again we were up early and on the road by 6:30am to try to beat the heat. 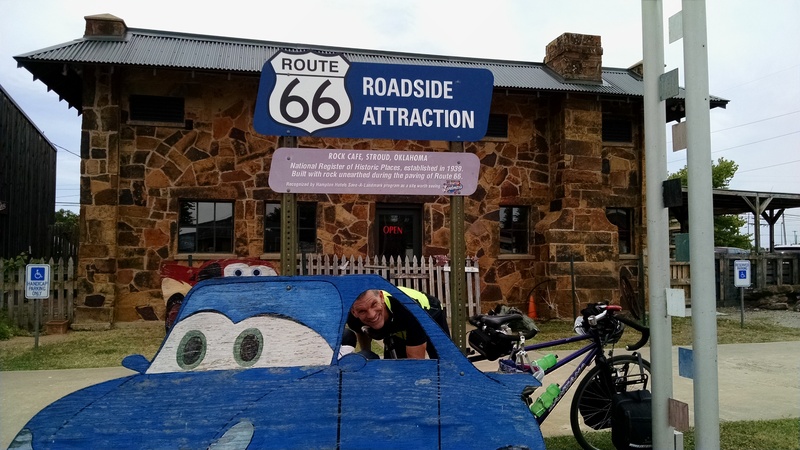 Our ride was pretty uneventful and generally followed Route 66 the whole way. This made navigating easy for Tracy. There was not a lot to see along the trip but we did see a huge blue whale just past the Twin Bridges over the Verdigris River – evidently the whale was built in 1972. The whale is 80 Ft long by 20 Ft tall and sits in a pond near the river. It definitely is a Route 66 must see. Slightly further down the road we saw the Tulsa skyline and were excited to get to the city to check it out. Plans are to take a day off in Tulsa and our Warm Showers host has graciously agreed to host us for two days. We are heading right to our hosts house when we get to Tulsa to get out of the heat. That evening our hosts – Robyn and Mike took us downtown for a neighborhood celebration and dinner at one of their favorite restaurants. We had a fun evening together and got a chance to see Tulsa. They took us out to several interesting places in Tulsa – including the Center of the Universe – an interesting place where you stand in a specific spot and talk and the sound echoes back to you, it is truly amazing and Robyn explained that the city has asked several experts to check out the area and try to determine why it echoes. No one has been able to figure it out. We took the next day off and our hosts were gracious enough to take us out again and continue the tour. We really enjoyed our visit and our hosts could not have been better. 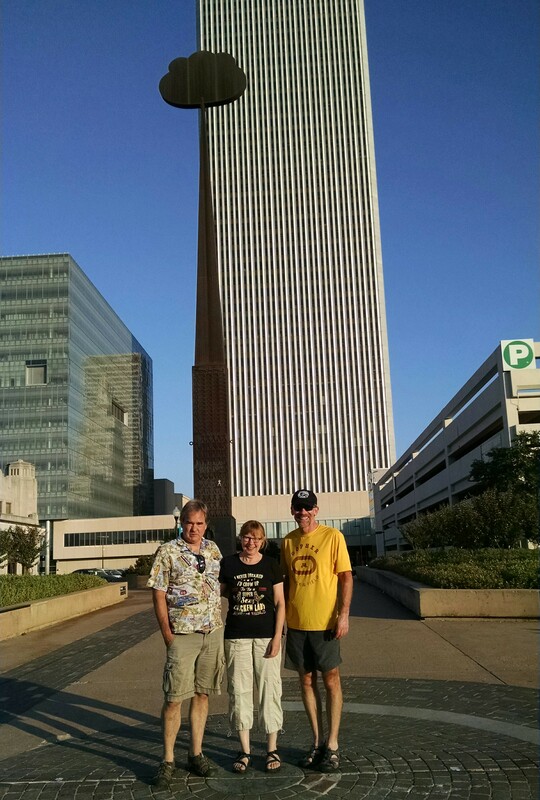 It was fun to see Tulsa with two people that know it so well. We got up early and were on the road by 6:30am to try to beat the heat. Shortly after we got on the road we were in Kansas – which has only 12 miles of route 66 going thru the state. 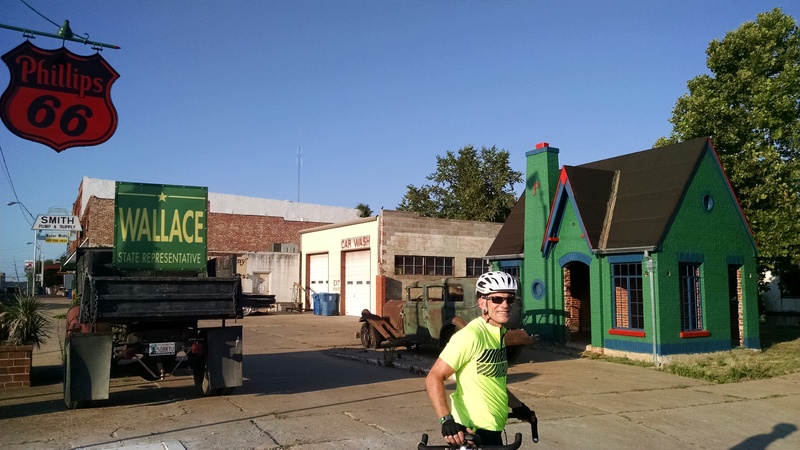 We bicycled thru 3 towns in Kansas, one being Galena which has totally embraced the Route 66 theme. The town is also know for the “The Cars on the Route Café”. Which is an old service station that has been turned into a deli. The other cool thing about the deli is the “Tow Tater” truck which was made famous in the Disney Movie Cars – “Tow Mater” was parked into the street in front. We have not scene the movie Cars yet I guess we will have to. Just outside of Galena is the Rainbow Bridge built in 1923- the only remaining single span concrete arch bridge on the entire length of Route 66. When bicycling across the bridge we almost ran into a woman from a group of tourist when she did not hear our repeated warnings that we were passing – she just kept moving in front of us. See the video of our crossing attached. 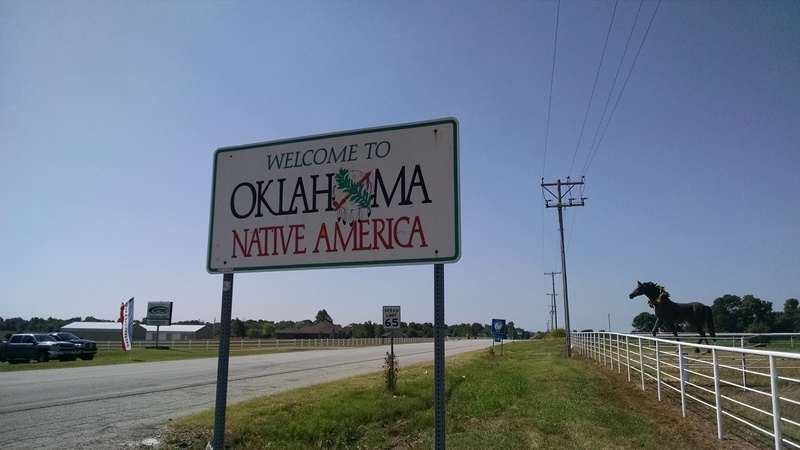 We then entered Oklahoma with the first town being Commerce- the boyhood home of Mickey Mantle. It was funny because as we were bicycling thru town Tracy saw a baseball field and commented that is was an amazing field and something special – at the time we did not know it was the boyhood home of Mickey Mantle and the beautiful field was built in honor of him – too funny!! The next town was Miami – where we bicycled right by the Coleman Theater – built in 1929 – in the Spanish Mission Style – quite an impressive building. It was part of the Orpheum Vaudeville circuit and hosted the likes of the Three Stooges, Tom Mix and Will Rogers. 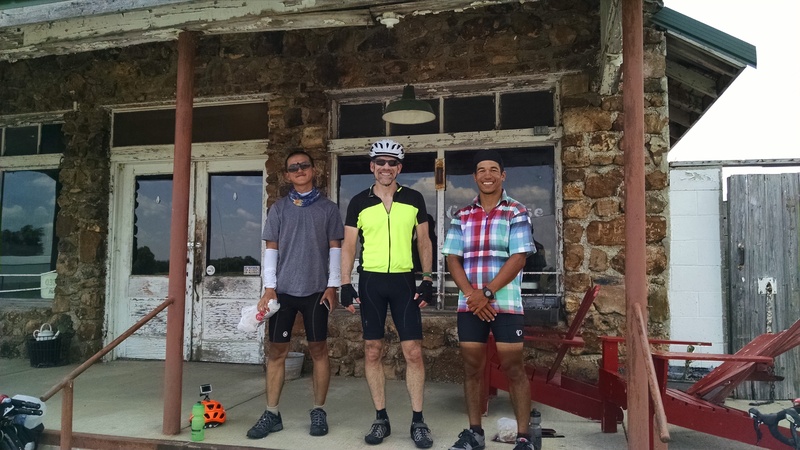 The last thirty miles to Vinita were tough, it was getting hotter, more windy and a bit more hilly. We were glad to get into the hotel and cool down!! Sorry this blog is late – it was done and due to computer problems it was deleted so I had to write it again – bummer. So enjoy!! After a great breakfast with our Warm Showers host, Dale. We all headed off on our bikes. 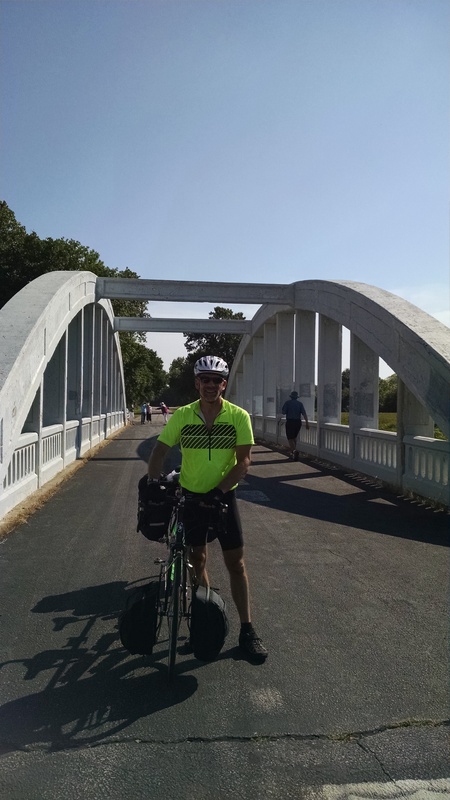 Dale rode with us the first 30 miles to the town of Halltown. 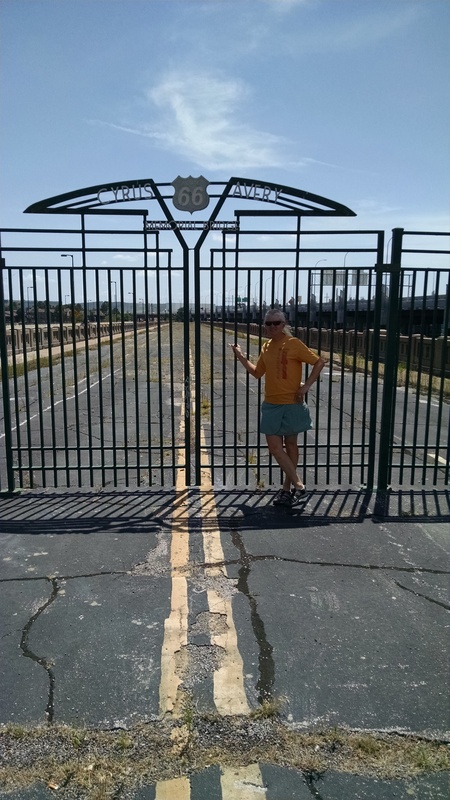 It was nice to have our host lead us out of town and also take us to the Springfield Route 66 Park. It was pretty cool and we were glad to get a chance to see it. After Dale headed back to Springfield we continued on trip to Cartage. The trip was good but the hills were tough near the town of Madison. Luckily there was a restaurant in Madison where we were able to get something to drink to help us on the rest of the ride. Our map said you would not find anything to eat or drink until you got to Cartage – 50 miles away. We were pleasantly surprised when we found the restaurant. Thank goodness the last half of the ride was pretty flat with a slight downhill. We were cruising along and looking for somewhere to stop in the shade to put on some sunscreen. We saw a old building on the side of the road and noticed a couple of bicycles leaning against the building and two young men taking a nap in the chairs on the deck of the building – I think we woke them up – oops!! 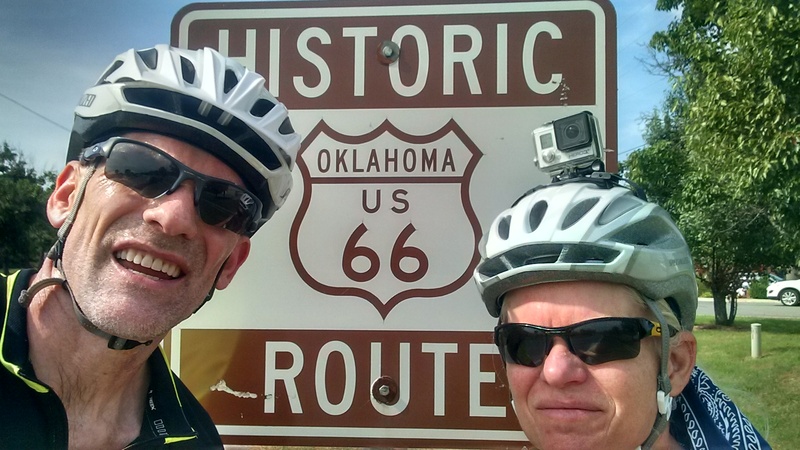 They were also riding Route 66 and taking a break. One young man was from Ohio(Tyler) and the other young man was from China, they had met along the route and decided to travel together to Santa Monica. Hopefully we will run into them again. 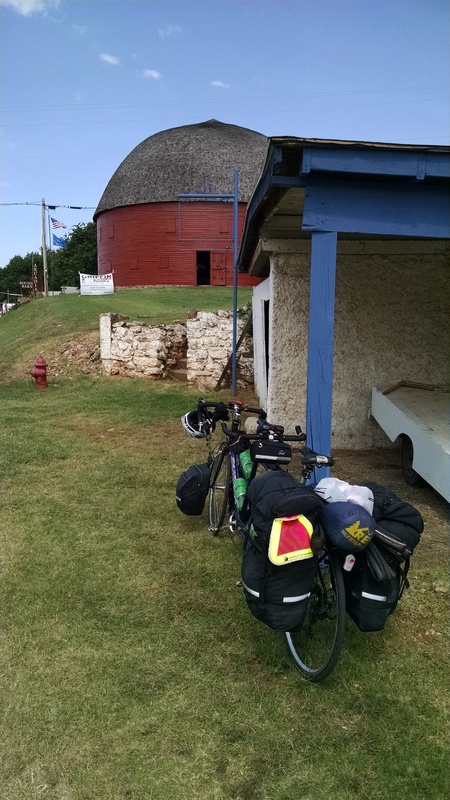 After a long, hot day we finally got to Cartage, MO and bicycled down their historic roads to see the amazing homes. Many are on the National Historic Register and some dated as far back as 1888. We will need to ride back thru the area tomorrow and will get a chance to see them again – YEA!! First we want to wish our fathers and the father figures in our lives a very Happy Father’s Day – Gil Meisner, Paul Flucke and Rod Mackenzie. Thanks for always being there for us!! Also Happy Father’s Day to all the other dads we know. Today was a short day and an easy ride to Springfield, MO. We slept in a bit later than usual and while eating breakfast the bicyclists from Switzerland – Nina, Christof and Dominic walked in. We enjoyed breakfast with them and then we all hit the road for Springfield. This is their last day on the road and you could tell they were having mixed feelings about being to the end. We remember that feeling on our past two trips – you are glad to have accomplished what you set out to do but at the same time, sad it is over. We enjoyed meeting them and getting to know them. We arrived in Springfield about 11:30am and went to the Springfield Brewing Company for lunch and a beer – of course. 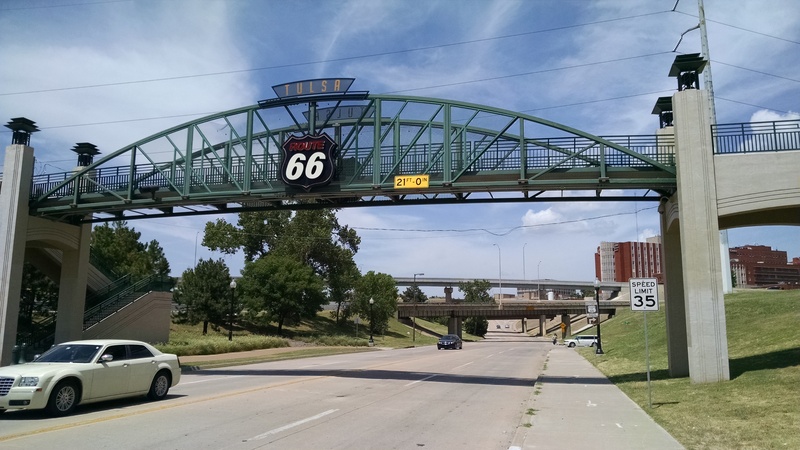 We then bicycled across town to check out the longest pedestrian bridge which crosses 13 railroad tracks. Unfortunately the walkway was closed for safety inspections. Oh well it was cool to see anyway. We then headed to downtown Springfield to check out the public square in the middle of downtown. The square is basically a small park with lots of green space and places to sit and relax. Unfortunately the downtown is really struggling and there was not much else to see or do in downtown. Our next stop was Mother’s Brewery – where we had a beer and then headed over to our Warm Shower stay. Our Warm Showers host Dale was born and raised in the city. He explained that the downtown has been struggling for many years and they are really trying to revitalize it but it has been tough and the businesses or people just are not coming back. It is a shame to see these downtown areas in the city struggling so much. Dale was a great host – he made us a delicious dinner, great breakfast and even rode us out of town the next morning. He also is a Massage Therapist and gave Peter a great massage. 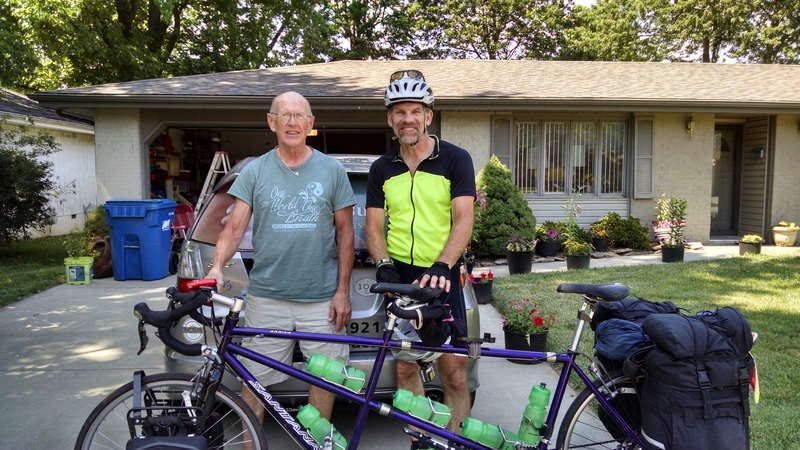 Tomorrow we have a long day on the bicycle as we head to Cartage, MO 72 miles away.